I saw Before Sunset at SIFF at the Cinerama and never found a moment to put my thoughts down. But I see it's out in theaters now, and so I wholeheartedly recommend seeing it in theaters. 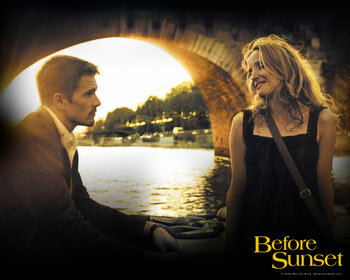 Before Sunrise is one of my favorite romances, and Before Sunset is its unexpected real-time sequel (Before Sunrise came out 9 years ago, and Before Sunset is set 9 years after the events of that movie). The timing works; no makeup is needed to see that Jessie (Ethan Hawke) and Celine (Julie Delpy) have aged physically. They're still attractive, but Hawke sports patches of grey, and both of them are leaner, not so much ravaged by time but perhaps hardened. Or are have they been starved for something they once thought possible? The plot consists of their reunion in Paris, nine years after that magical day they spent together in Vienna. They have much less time this time; Jessie's plane home to America leaves in an hour and a half. Fortunately, they spend it strolling through Paris, perhaps the most endearing pedestrian destination anywhere. Hawke and Delpy blur the lines between reality and performance by ignoring them. Hawke plays an author in the movie (as he was in real-life), and Delpy speaks of having spent time in NYC (she did, as a film school student at NYU). These characters have become as much theirs as Linklater's, and all three love Jessie and Celine in a way that no fan of the first move need fear the taint of a financially motivated sequel. Yet this is a sequel that risks even more than its predecessor, and that's a rarity. As with most Richard Linklater movies, much of the movie consists of dialogue. Not just any dialogue. This kind of conversation sounds more genuine than the usual theatrical rhetoric and yet it dances from topic to topic with an emotional honesty and intellectual curiosity that holds our attention until we step back and see the brilliant tapestry that Linklater, Hawke, and Delpy have woven. Linklater fans love to hear his characters walk and talk. Neither Jessie nor Celine is as young and impulsive as they once were, and yet they find themselves grasping for something they hope isn't simply nostalgia for a day that sparked on physical attraction. We sense it isn't; their minds flirt on streams of dialogue. And if it their conversation is at times pretentious (as when they discuss the environment and other such current events), it's no more so than when we hear it from our more crusading friends. Without revealing any major plot points, we come to realize why they are so desperate to preserve this moment they have with each other. The real-time feel of the movie works wonderfully, for the most part. We feel the urgency of Jessie's impending flight time because we sense it will end not only their encounter but the movie. That's why the ending is so perfect. When it arrives, unexpectedly, we feel that our two heroes have managed to stave off the tyranny of the clock and carve out a space in time for themselves. The final images as the screen fades to black are enough to hold us until what would be a welcome next chapter in a new type of franchise: the romantic walkie talkie.